Baltimore, Md. — Sagamore Racing’s Miss Temple City proved she was the favorite in Black-Eyed Susan Day’s first stakes race by winning the 43rd running of the Hilltop Stakes presented by Rams Head Group. Later in Race 7, Sagamore Farm homebred filly, Charm City Girl rallied to win a $52,000 Allowance by a nose. Both horses were under jockey, John Velazquez and are trained by H. Graham Motion. In the Hilltop Stakes, Miss Temple City was the 6-5 choice, moving patiently until turning home to win the 1 1/16-mile race by 2 ¾ lengths over All in Fun. She covered the firm turf course with a final time of 1:41.94. A three-year-old filly by Temple City, out of Glittering Tax, by Artax, she entered the race after finishing second in the Grade 3 Appalachian Stakes at Keeneland on April 12 behind Lady Eli, one of the top ranked fillies in the world. This was the fifth career start for Miss Temple City who runs for Sagamore Racing in partnership with Allen Rosenblum and The Club Racing, LLC. Making her four-year-old debut, Charm City Girl battled down the stretch to edge out second place finisher, Silverville. Her last race was on June 19, 2014 at Monmouth Park where she finished second in the Desert Vixen Stakes. This was her second career victory and improves her record to 7-1-2-2. 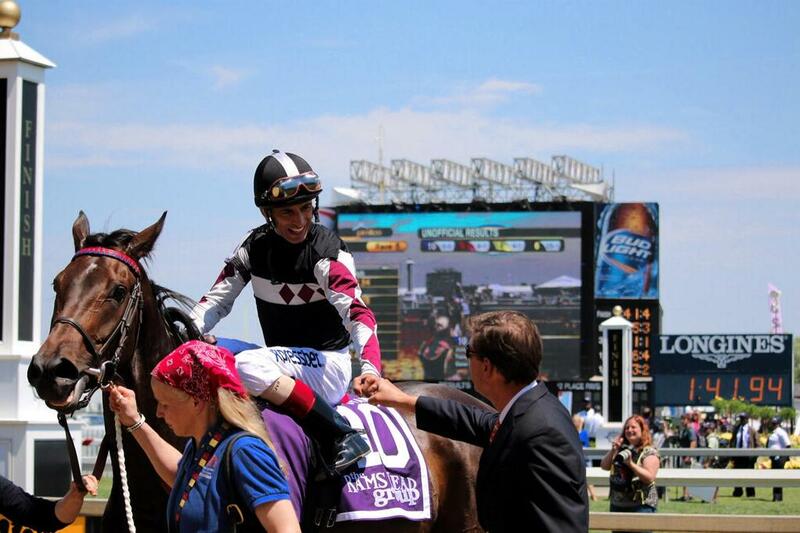 Sagamore Racing will have five horses competing in stakes races on Preakness Day. All I Karabout and Commute are entered in the $100,000 James W. Murphy Stakes. Happy My Way is aiming to become a repeat winner in the Grade 3 $150,000 Maryland Sprint Handicap. Tizgale is entered in the $100,000 The Very One Stakes and War Correspondent will run in the Grade 2 $300,000 Longines Dixie Stakes.